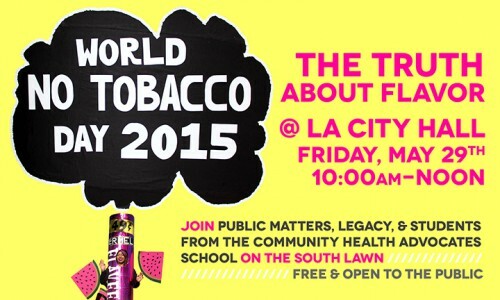 The Truth About Flavor culminated with the public celebration of World No Tobacco Day on Friday May 29, 2015, on the South Lawn steps of Los Angeles City Hall. A momentous and festive occasion, our CHAS (Community Health Advocates School at Augustus Hawkins High School) students were joined by City Attorney Mike Feuer and his Tobacco Enforcement Prevention team led by their incomparable Program Director Nora Manzanilla. Our Public Matters group arrived early that brisk Friday morning, and were quickly joined by our project partner Legacy, represented by Vice President and Director of Community and Youth Engagement, Laura Hamasaka. We arranged the bright, shiny Flavee costumes and puff cloud accents in anticipation, waiting for the arrival of our guests while leaving our mark on the event and City Hall. Our core group of senior students arrived shortly thereafter. Flushed and giggling, anxious, they stood in awe before City Hall. I took a poll and there was a consensus, it was the first time any of them had been to City Hall. 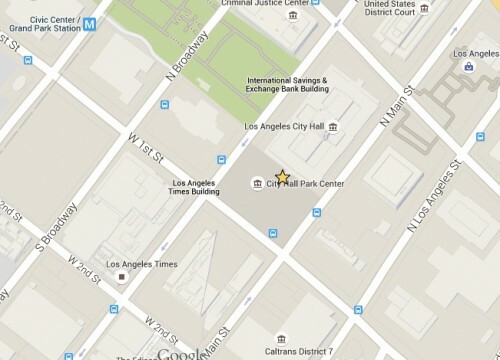 As residents of South Central, many of them have never seen spaces beyond the boundaries of their neighborhood. Yet on this day, they readied themselves to present to esteemed organizations and community members for the betterment of the City of Los Angeles. For the entirety of an academic year the students had worked vigorously on the project. They now stood on a grand platform to present their work and speak on behalf of their community as advocates. They spoke on the reality of the conditions of South Central, a high-need, low-income neighborhood – how the consumption of tobacco affected them personally, how it shaped urban landscape of their city, and how it ultimately contributed to the deterioration of their community’s health. The students received billowing applause for their words and for their courage in taking on their role as leaders for the community health of South Central. At the end of the presentation they were each honored with Certificates of Appreciation by the Office of the City Attorney, presented to them by both Nora Manzanilla and the Director of the Los Angeles County’s Tobacco Control and Prevention Program, Tonya Gorham Gallow. Our young leaders smiled proudly as they were presented with their awards, the first of many to come.